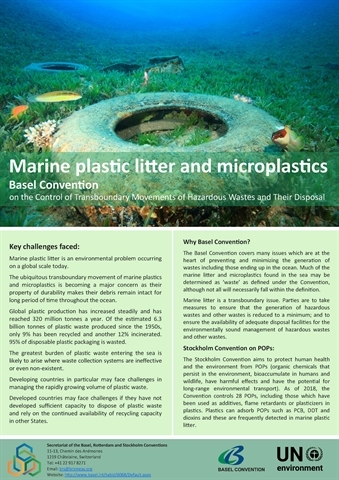 At its eleventh meeting, the Open-ended Working Group (OEWG) considered the report on possible options available under the Basel Convention to further address marine plastic litter and microplastics and took note of the information on activities related to marine plastic litter and microplastics undertaken by regional centres. 1) Agreed that the draft elements set out in the annex to the decision should be a basis for a decision by COP-14 on further actions on marine plastic litter and microplastics. Parties and observers were invited to submit comments on the draft elements to the Secretariat by 31 October 2018. 2) Welcomed with appreciation the proposal submitted by Norway on the establishment of a Partnership on Plastic Wastes and recommended to the COP-14 the establishment of a partnership under the Basel Convention on plastic wastes that also addresses marine plastic litter and microplastics. Parties and others were invited to submit comments on the draft terms of reference of the partnership and suggestions on elements of the work programme of the partnership for the biennium 2020–2021 by 17 December 2018.